Deciduous shrub, 1-3 m tall with many stems, densely clumped or spreading by suckers; twigs sparsely to moderately hairy, sometimes glandular. Alternate, deciduous, elliptic to oval, leaf blades heart-shaped with a sharp-pointed tip, doubly saw-toothed, paler below than above, 4-10 cm long, turning yellow in the fall. 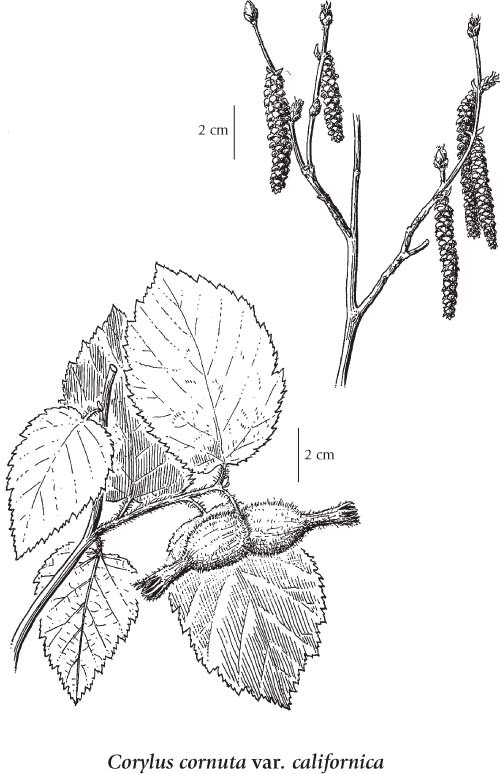 Male flowers in catkins appearing before the leaves in spring; female flowers in a very small catkin with protruding red stigmas. 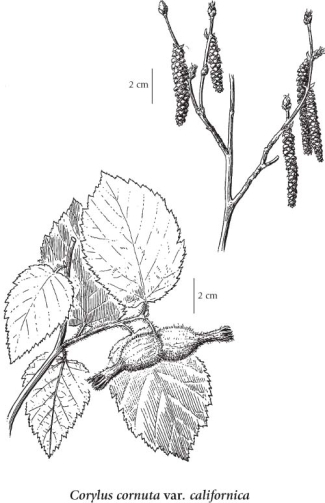 Edible hard-shelled nuts completely enclosed by bristly bractlets, in 2's or 3's at the end of branches, barely 1.5 cm long, thinly hairy or glabrous. Mesic sites in the lowland and montane zones; var. cornuta - common south of 57degreeN east of the Coast-Cascade Mountains, var. californica - frequent on S Vancouver Island and the lower Fraser Valley, becoming rare to the east; E to NF and S to GA (var. cornuta) and E to ID and S to CA (var. californica).